The Macallan 1926 painted by Michael Dillon. UPDATE: IT SOLD FOR £1.2 MILLION, A WORLD RECORD PRICE FOR A BOTTLE OF WHISKY. 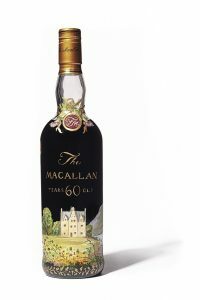 Hard on the heels of the sale of the most expensive bottle of whisky in the world for £848,000 at Bonhams in Edinburgh this week a unique bottle of 1926 Macallan painted by the Irish artist Michael Dillon will lead Christie’s sales of finest and rarest wines and spirits in London next November 28-29. The Macallan Valerio Adami 1926 60-year-old sold at Bonhams was in a vat for 60 years and then bottled,. It fetched £700,000 plus a £148,000 sales premium. Experts describe it as the holy grail of whiskies, because of the combination of its rarity, vintage and unique artwork. Another bottle of The Macallan Valerio Adami 1926 was sold at Bonhams Hong Kong in May this year for a then world record £814,081. Macallan commissioned pop artists Peter Blake and Valerio Adami to design labels for a limited edition of 24 bottles -12 Adami and 12 of Blake. The most collectable single malt of the 20th century at Christie’s, The Macallan 1926 60-Year-Old, is presented in a unique bottle painted by the Irish artist Michael Dillon. The Macallan distillery located near the river Spey in North East Scotland was founded in 1824 and produces stunning examples of cask-matured single malts, particularly their highly prized and exceedingly rare single-cask, limited edition bottlings and Fine & Rare Collection. This is the only bottle of this ultra-rare elixir to be hand-painted by Irish artist Michael Dillon. Considered the ‘Holy Grail’ for collectors, it is poised to set a new world auction record for a bottle of whisky. This entry was posted on Thursday, October 4th, 2018 at 2:29 pm	and is filed under AUCTIONS, Miscellaneous. You can follow any responses to this entry through the RSS 2.0 feed. You can leave a response, or trackback from your own site.